Somebody pointed out to me that the augment cards are very similar to the meld mechanic from Eldritch Moon, which seems obvious once you see it. In addition, Unstable was apparently completed in concept a number of years ago but not scheduled for release until later . . . which means that this card probably did in fact inspire Chittering Host and the like, but came out after them. Are you confused too? That’s okay. It’s an Un-set. I’m not sure whether the way you combine augment cards is weirder than meld, or less weird. I do know that the range of possible effects you can have is much bigger, and that you can use the cards pictured above to get almost any effect you want at almost any time you want. I know that against certain decks, combining these two together will make you invincible to damage provided you roll your d6 well, which is about as good as you get in a silver-bordered set. (Plus it also references that joke on The Simpsons about the horse with the head of a rabbit and the body of a rabbit.) The Half-Kitten part makes for some interesting strategic tension since the easiest way to trigger it is to eschew blocking; it also makes for some interesting combos with older cards like City of Brass and Rumbling Slum. Here I was under the impression that Brisela was the most terrifying creature fusion. Now behold the most sinister creature to ever be printed on cardboard, the Half-Kitten, Half-Kitten! 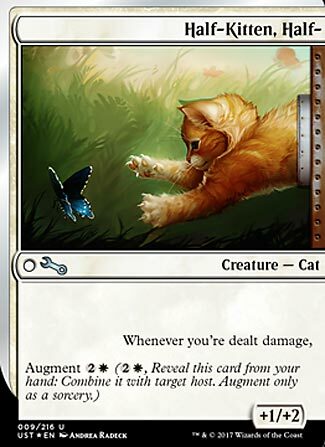 Adorable Kitten fits right in with cat tribal as a simple 1-drop for a bit of life is not bad at all. If you want to be stylish you can also include the augment to give a non-cat a boost from Regal Caracal. Let’s talk about Augment. The aforementioned Brisela is in my top 5 favorite cards of all time. (I count it as 1 card. My list. My rules.) The problem with Meld though is that is is very restrictive, especially on legendary creatures. Augment solves this problem with a simple but fun “A+B” mechanic. This can create some pretty crazy combinations that not even play testing discovered, such as Half-Squirrel, Half-Pony. Although Ordinary Pony received an errata, it still goes infinite with R&D’s Secret Lair. 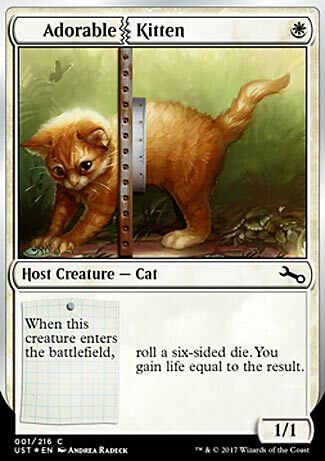 I like to think the best augment for Adorable Kitten is of course, “Half-Kitten, Half-.” The kitty can stall most weenie decks or allow for some self damaging shenanigans outside of White. Unfortunately Windswept Heath and Temple Garden do not deal damage. In Commander, unless you are playing with Dr. Julius Jumblemorph, it is going to be hard to get the pieces together. Unfortunately using the good doctor limits your creature selection to only White and Green. This one is a bit of a two-fer, showcasing one of the two flagship mechanics of Unstable (the host/augment mechanical pair). And we start with the cutest one, since everyone likes kittens. I think. This one is a pretty simple one. The Adorable Kitten gives you steady lifegain, if unreliable; while a 1/1 that gains you 1 life isn’t great, you average 3-4 life per Adorable Kitten, which is a good bit better. So it’s a fair start. The Half-Kitten, Half- augment gives a modest power boost and a trigger whenever you take damage…whether combat or otherwise. Coupled with Adorable Kitten, it offsets all damage you take by giving you back some life in the process, which can make it very hard to race. The flipside is that this amalgamated non-monstrosity is only a 2/3, which still is pretty vulnerable to a whole host (ba-dum-tss) of removal and effects.